Karate is a terrible film, and yet I watched it. Another of my ‘if it’s under a dollar, I’ll buy it’ VCD collection, this adventure without subtitles was entertaining for all the wrong reasons. Mithun Chakraborty and Deb Mukherjee star as brothers separated well past the age at which they should remember their own names and that they have siblings. They are each out for revenge on Kader Khan. And there’s the Karate. 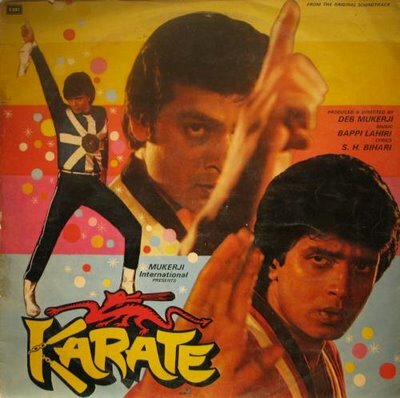 The film opens with the Karate boys, Desh and Vijay, and their Karate uncle Jai training on a beach under the watchful eye of their parents, Mr and Mrs Karate. There is a horrible family singalong and terrible child actors (Kajal and Tanisha are credited as junior artistes but I can’t say I noticed the unibrow). Thankfully, we soon discover that Mr Karate is in fact a Scientific Genius and has invented? a diamond that will focus a laser so powerfully it cuts through anything. He hides the diamond in a necklace but master criminal Kader Khan had the room under surveillance so he knows what to do. He kills Karate Dad and terrorises Karate Ma and children. Desh escapes on horseback and starts a whole new life with carnival folk about 2 kilometres away, where no one will ever find him or be able to trace his origins. Vijay is adopted by Uncle Karate who renames him Danny. Finally it is Kader Khan who sort of reunites the Karate Kids. He finds Karate Uncle Jai and threatens him so of course Jai stabs himself with a broken bottle and dies – after a long explanatory speech to Danny/Vijay. Revenge, brooding, slomo acrobatics, disco and clumsy Bond homage round out the next couple of hours. And Karate. So much “Karate”. In order to shield you from the worst and perhaps enliven the viewing experience, I propose a simple drinking game. Even if you stick to non-alcoholic beverages, at least you’ll be nicely hydrated by the end of the film. Here are some clues and the rules. Mithun looks like he’d rather be elsewhere. 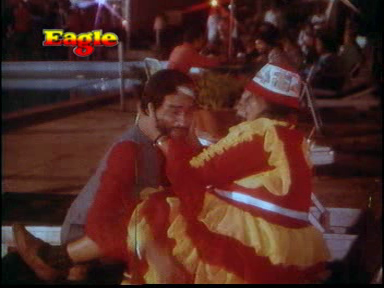 You witness Mac Mohan and Tun Tun cavorting poolside. You spot a direct rip-off of a Bond film. You hear the word “Karate”. 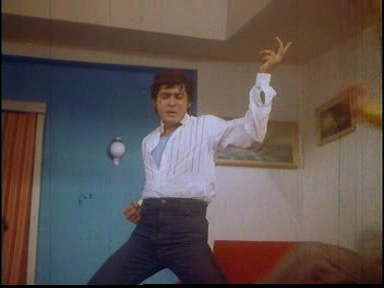 Deb Mukherjee directed and tries to make himself look dashing and daring. He lifted several scenes from Bond films, and I suspect even used footage from The Man With the Golden Gun. His character Desh is a thief (preferably diamonds) and a chancer, even stealing a statue from a temple. The ladies love him, and this is shown by a traditional gypsy mud-wrestle between two of his admirers. 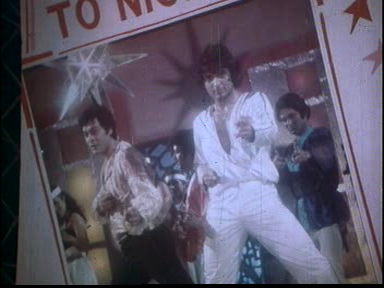 Desh and his faux-bro Imran (Mazhar Khan) also perform a nightclub disco karate routine that is almost guaranteed to bring a tear to your eye. 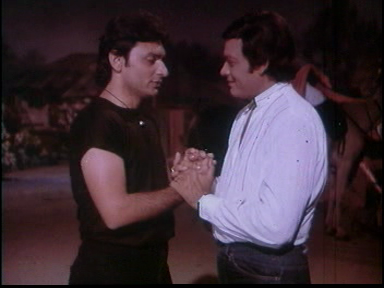 Danny/Vijay (Mithun) is sulky for most of the film – maybe he just felt the burden of perfection. He crosses paths with Desh and his long lost Ma so many times that it is ridiculous even by filmi coincidence measures. 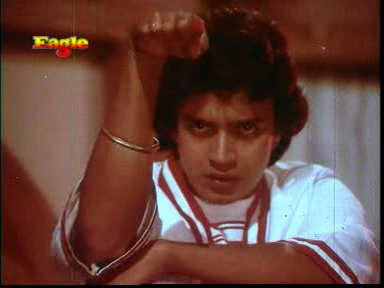 Mithun does a lot of his signature ‘dancing’, including one excellent nightclub scene where the baddies don’t know the choreo and can’t anticipate the swings and kicks that block their way. He even survives an attack involving flaming kebabs. Despite their roles being quite strong and motivated, the actresses are generally filmed in the sleaziest way possible (except for Karate Ma of course). I did like that Kaajal took on anyone who threated her man, extricating the fairly dim Desh from trouble even if it meant running him over and kidnapping him. Deb and Mithun are not exactly miscast (who else would have done this kind of film in 1983? ), but don’t convince as martial arts heroes no matter how much you bling up their costumes. There are some really quite remarkable plot twists. Desh tries to escape the police at a wedding he is robbing so he poses as the groom and ends up married to Kaajal Kiran. This doesn’t go down well with the very assertive Prema Narayan and the ladies have a karate catfight as well as a fight that is inspired by From Russia With Love. Luckily Danny turns up and starts shooting people and stops the skank off. There are fabulously ridiculous low budget stunts and effects, including some great Dukes of Hazzard driving skills. Even poor Yogita Bali ends up dangling from a conveniently placed rope ladder outside her apartment as she tries to protect the diamond necklace. People turn out to be related to key characters and there are a few moments when subtitles would have helped as I thought ‘dude … is she your sister?’ And what is not to like about a film that resolves major conflicts through disco Karate in a bizarre set? Here is a snippet for your viewing pleasure. The music is exactly what you expect when you combine Bappi Lahiri and Mithun. 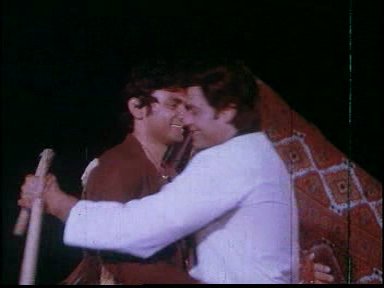 It is dire yet, when compared to Mithun’s endless speeches, a joy to hear. The costumes range from pedestrian to eye searing, and I would demand nothing less from an 80s B movie. It did confirm to me that my love for Chiru is not just about the silver go-go boots. While Kader Khan’s lair looks rather spectacular, the spy gadgets and bombs are as realistic as if my nine year old self had made them from egg cartons and gaffer tape. Karate is kind of fun although highly questionable. One for the Mithun completists, and anyone who has ever considered a career as a diamond thief/cabaret performer. No stars. Wait! 2 stars! My inner Margaret and David cannot agree. Maybe I’m a victim of my own drinking game. This entry was posted in Bollywood and tagged Adventures without subtitles, Bappi Lahiri, Bollywood, Deb Mukherjee, Hindi, Kaajal Kiran, Kader Khan, Karate, Mazhar Khan, Mithun Chakraborty, Prema Narayan, Yogita Bali. Bookmark the permalink. just wanted to tell you that I´ve nominated you for the “My Liebster Blog” Award. Although I rarely ever comment, I love, love, love reading your posts. They are always so much fun and very insightful – Keep writing!